First time I’m using ‘hack’ in a public space. I know language changes, but I kind of hate the word. Some people hate ‘purse’ or ‘moist’. I don’t really use “hack” or “make” as it relates to sewing. ::shakes old lady cane and adjusts reading glasses::. Long post to follow, but I also have construction photos, tips and video on my Instagram story highlights. 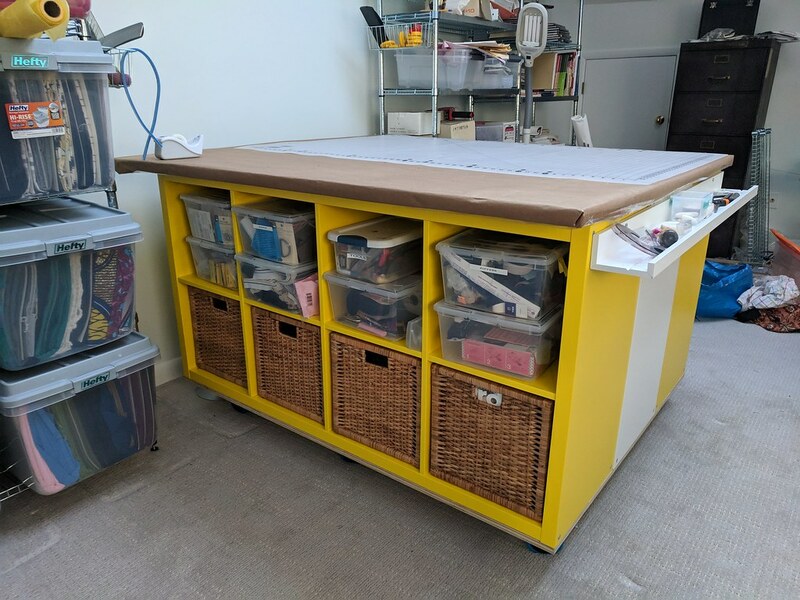 Today I present my sewing loft cutting table! My new sewing room is a loft on the third floor of our house. It’s long and narrow and my old, beloved orange sewing desk didn’t fit the room. I was also blessed (a word I do not take lightly) to meet and become friends with fellow maker Elizabeth, who works professionally as a commercial interior designer. She was generous enough to design a sewing room for me. Won’t lie, I was going to move the cutting table to a different part of the room. But, as I started to build it, it totally made sense where she put it. 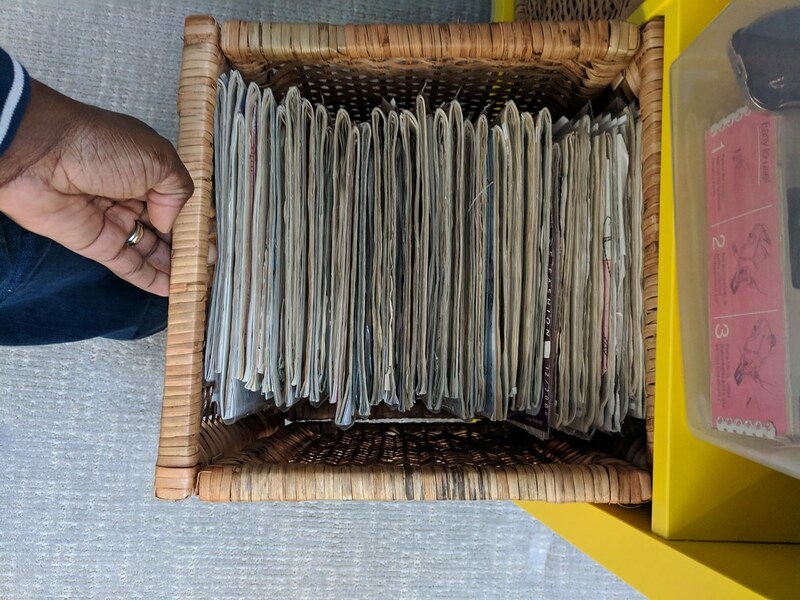 I settled on the Kallax Craft Table hack from Family Handyman specifically because it could house my 10+ years of Burdastyle magazines. If this isn’t a consideration, check out Closet Case Pattern’s cutting table or Brooks Ann Camper’s or Rowley’s professional work table (with detailed instructions). Lucky to have Liz and Jordan help me! After some fantastic feedback on Instagram, I decided to use Homosate from Home Depot for a pinnable layer on the table top. 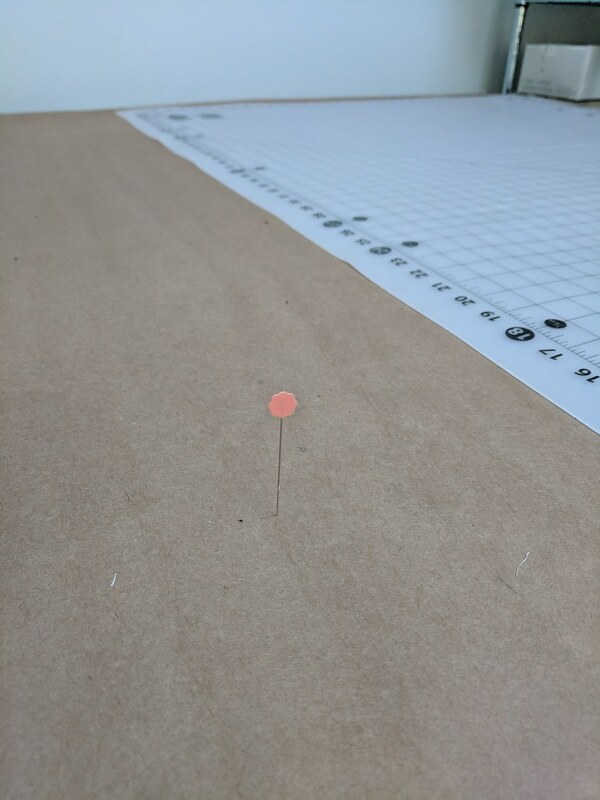 At first I thought I didn’t have anything I needed to pin to my table top. But, folks told me all the ways they use the pinable layer and I went for it. It’s covered with butcher paper and just taped down with packing tape. I got this idea from Brooks Ann Camper’s blog. I’ve since done my first FBA and bicep adjustment with this pinable table and it is LIFE CHANGING. Now, the knitty gritty of what I wish I did differently and what I was thinking in construction. I wanted my table top to be at least 45″ wide so I could easily have the bulk of the fabric on the table if I single layer cut something. I NEVER want to have to cut from the floor again. My back is 42, not 22 and it yells at me for days when I cut on the floor. Storage is paramount. As noted above, I wanted to keep my Burdastyle magazines organized. And, I needed someplace to store longer bolts of things (muslin, batiste, linings, silk organza). The table needed wheels because access to the roof is in the sewing loft and if there was a problem. I needed to be able to move the cutting table easily. I also wanted something I could walk around. So, I didn’t want it pushed up against the wall all the time. My wheels are 4″ high. This also helps get the cabinet to a comfortable cutting level for me. Total table height is 39″ and perfect for 5’6″ me. 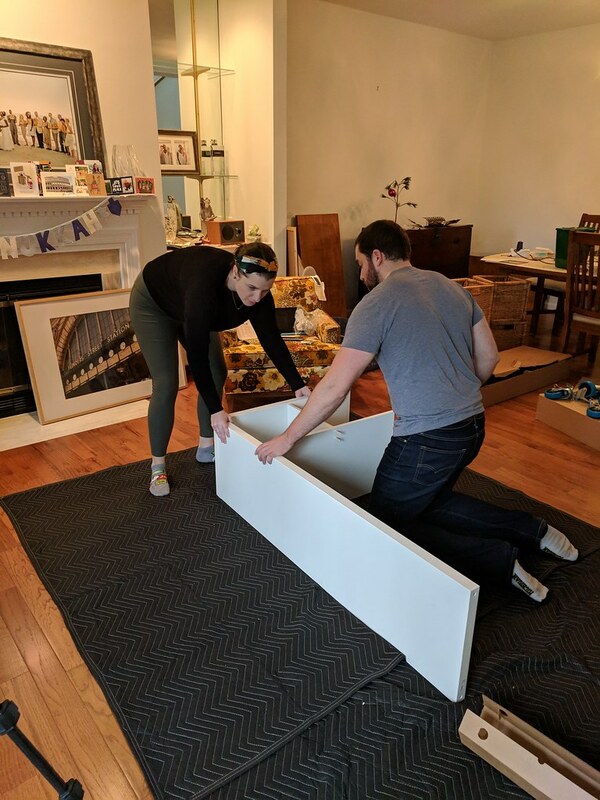 I used three KALLAX in a row which comes to about 46″ wide and 58″ long. Pretty much exactly what I wanted the finished table top to be. Jasika suggested I determine my countertop finished measurements by what mats I’d be able to buy in stock. I did! But…. I didn’t account for toe clearance (thanks, Beth!) and I didn’t think too much about the countertop edge coming off of the base (thanks, Carly!). Apparently, you want 3.5″ to 4″ toe clearance so you don’t stub your toe when getting right against the table. And, you want that top overhang so you don’t bang you knee against the base of the table (mine is 3″). Once I finished assembling the base and these above issues came to light, I realized I was going to need to make a much bigger top to my table than I planned. Yes, I could have used two cabinets and cut my top to to the size I wanted. But, I’d already assembled the three, so one wasn’t returnable. And, I *could* use the extra storage provided by the middle piece. Because my countertop was now bigger than I planned, I had to buy more plywood than I budgeted for in order to cut pieces to the right dimensions. If I’d known / thought about these things before, I might have stuck with two KALLAX as my base and made my countertop as wide as I wanted. 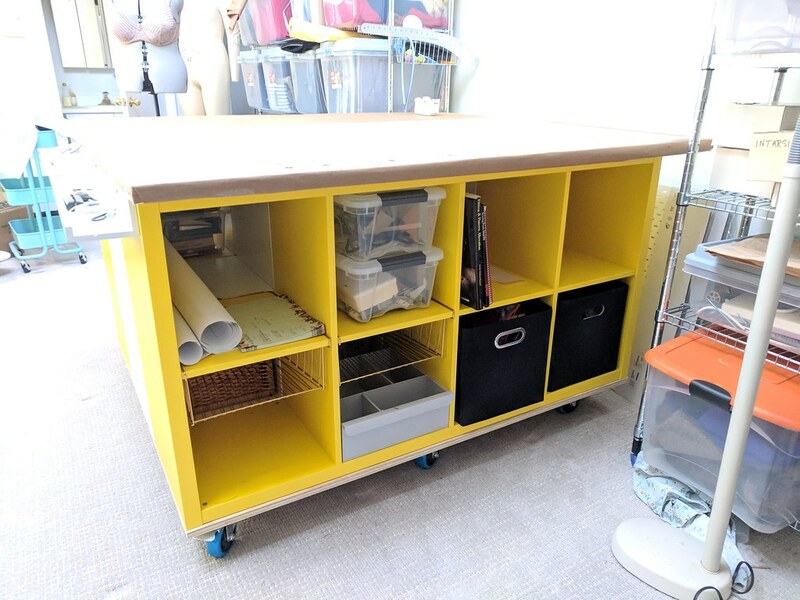 But, with three next to each other, the KALLAX base required a top that was 60″x54″. That’s just too big to get out of one 4’x8′ piece of plywood. That added $50 to the project. Plywood comes in 4’x8′ sheets. Plus, the interior KALLAX was $60 more. And, now the custom self healing mat I need for this table top will be near $300. OUCH. I will still be buying a custom self healing mat for my table. But, honestly not until next year. It’s going to be expensive and after this project, I need to sit on my credit card for a few months. And, my old cutting mat from Joann’s works just fine for now. There she is! I LOVE this table. Like, sometimes I come up to the room just to look at it. It’s so comfortable to cut on. Alterations are a dream with the pinable top. The width allows me to lay out fabric easily. The storage is EXCELLENT. Everything is at my fingertips. And, my beloved Burdas are in easy reach. Oh! That’s the MOSSLANDA picture ledge. I added it to have a place to hold scissors or pins — things I’m using at the moment. I have a lot more work to do on this room. But, just this table and getting most of my boxes out of the room have seriously improved my attitude and mood. I was so depressed coming in here. I could never find anything and continually digging through boxes for thread, chalk, etc. Next up: Thread racks on the wall and pegboard for tools! I also need to look into my sewing table / desk situation. But, want to work in the room a little more to figure out what meets my needs best. There are no ceiling lights in the room, which makes nighttime sewing miserable. Hopefully we sell our old house this year and I can get the electrician in to do some wiring for me. More to (slowly) come! Wow thats great. How to you access the middle Kallax unit? I just pull out the baskets to get what I might need. My plan is to have mostly the older burdastyle’s that I’m not accessing regularly in the middle section. Tools and trims to the front. And, on the other, more empty side will be mostly knitting stuff since my knitting machine is on that side of the room. Well, as usual, this was thorough, helpful, and inspiring! It’s great to know what works and what needs consideration. Someday I will have this type of set-up, but not now, so I will refer back when I can. I am looking for your enthusiasm about sewing to bloom with this new space! And being on the third floor means quiet and focusing will be even better, yes? It’s so quiet! The dog can barely be bothered to come look for me, lol. We actually put in Amazon Echos throughout the house because we got tired of shouting to each other. This is Fantastic!!! 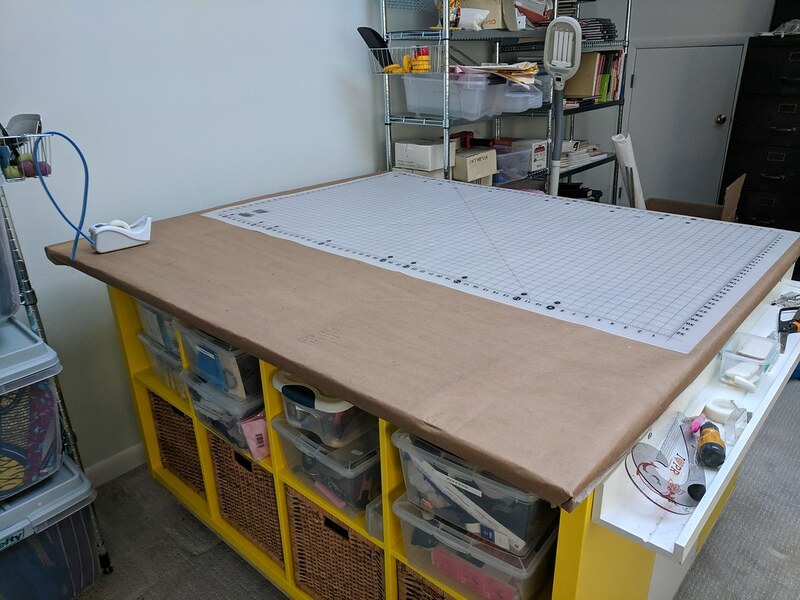 The bigger taller cutting table made a huge difference for me, Hope it does to you too. Can’t wait to read up more on how to create your new sewing area. what would you do with the older desk? Home office, perhaps? This is freaking awesome! Is white hot jealousy an inappropriate response? Sigh. It’s so lovely. I accept your white hot jealousy! If it helps, I have way too much stuff and could still do a good purge. Serious table envy here! I watched it come together on Instagram and it looks ideal. I have a tall table for cutting out and it really saves my back, for the pinnable layer I use curtain interlining. Wishing you lots of new makes (! 😉) in your new room! Ps. The word I can’t get used to is ‘sewist’, just doesn’t sound right to me! Before interent sewing, I knew I hated ‘seamstress’. Sewist seemed like a good compromise. But, no one outside of our community knows what it means. Weirdly, I like ‘maker’ to descrive myself. I’m full of contradictions. Whatever happened to ‘seamster’? Wasn’t that word floating around for a minute? It is AWESOME. 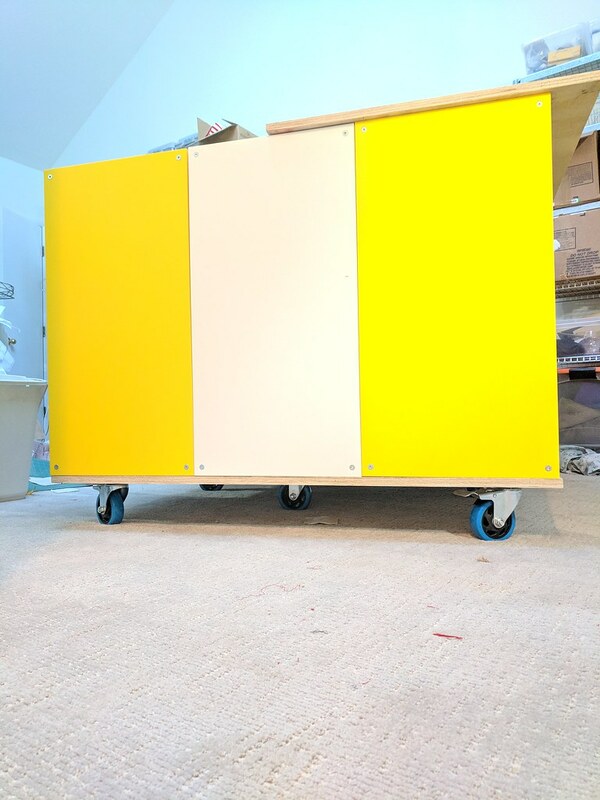 It’s glorious and the storage is fantastic and the wheels are ingenious! I do often see people ask about the “best height” and it’s so dependent. I’m only 5’5″ but my 36″ table is not tall enough. Of course, it’s loads better than normal table height or floor cutting (I did that one time ages ago and never, ever again!). I think 38-39″ is ideal. Congrats and cannot wait to see the rest of the room! I DID! Hahaha! I was reading the range of sewing table heights and what is ‘best’ for me is actually about one inch shorter. This seems to be great at my height. I was cutting on our dining room table for one project after moving and I said, NOPE. I then tried cutting on the kitchen counter, also not ideal. Finally I was just cutting where I teach sewing lessons becauise it was the only place that worked. I would love to not have carpeting in this house. But, it was new when we moved in, so it stayed. You are an inspiration!! The homasote covering on your cutting board is so fantastic. Sheer brilliance. Glad to see that you are making serious progress on setting up your studio space. Having a custom cutting table is the best. I have to admit that I have light envy, as in bright lights. Gahh! Now that I am in Portland Oregon, that is what I need to brighten up my sewing/knitting room. Oh, it’s marvelous in the day! I have two skylights there. But, no central lighting so sewing when it’s dark kind of stinks. When I get the other house sold, the first thing I’m doing is getting the electrician out to run some task lighting for me. That is fantastic!! One of my friends was telling me to get plant growing lights, so that it brightens up the room. It is still dark even with two Ott lights. I did buy an architect’s lamp that I have on a metal shelving unit next to my cutting table. That has made a humongous difference. I so wish that I could paint the walls, but it’s a rental. Wow! Just wow! What a beautiful and functional room! I want one. Thanks for sharing your design ideas and challenges. This is superb! I’m sure you will be glad you went with the bigger option even if it was a bit of a headache and bigger budget at the time. Enjoy your gorgeous new space! Yeah! I think so. I was sort of complaining to my husband about it, and he said it seemed like it would be worth it for the extra inches I was going to get. Nothing makes me as happy and as jealous as to see someone’s new sewing space. Yours looks awesome. I love the size of mine, but it’s in the unfinished basement, all I want is walls :). Congratulations! If lived closer I’d volunteer to come and help you unpack. I have 13 more boxes left to unpack 😂 😭 And still need to organize my shelves. Sigh. It looks wonderful! Cutting table envy!!! It is so perfect! Even this mostly laptop sewist wants one. Heap more envy on the pile! I have sewing room envy! You are one blessed gal! I’m feeling pretty blessed! It’s a little narrower for a room than I’d prefer. And, I don’t have any lighting in there yet (no celing lights, but two awesome skylights). So, there’s definitely work to be done. But, I never thought I’d have a space like this. Ah! The paper over the Homasote makes sense! I hope you have adequate support for a heavy table. I have that cutting grid, and it is NOT an exact measuring device. It’s always square, but measure it a foot out with a metal rule. Nope. Rolling it distorts it. Otherwise, wonderful. And since I do very little that requires exact precision (that I didn’t also measure out on the same board), I’m good. Yep! It’s on 3/4″ plywood and eight wheels that can hold a 100 lbs each. I hope I can save my pennies for a self healing mat. I really prefer rotary cutting. Beautissimo! I love my homosote pinnable surface also, it is pretty fab. Congrats on your new sewing room, enjoy the heck out of it! It was a totally new to me concept. I’m so glad I asked opinions on Instagram because I didn’t realize how helpful it could be. In love. Thanks for taking the time to blog this for us! Great suggestions, which I will be incorporating shortly. My pleasure! I was helped so much by the sewing community on Instagram, I thought it only fair to put the info in one place. The Family Handyman is a good jumping off point for a ‘craft’ table. But, sewing (I think) has some special considerations. If you would just make one of these for me now, that would be fab. I love it. I don’t use Pinterest. Nor do I follow many blogs, only a few, only the best. Thus I didn’t know about your table coverings. I thought my flannel over hinged plywood was good, but this new idea looks better. As does your table. And the room. All of it. I’m so glad for you and so inspired. I assumed IKEA was literally EVERYWHERE! I thought they were the Amazon.com of home furnishings. I probably don’t need a giant custom mat. I should also figure out just how often I would need/ use it too. It’s a big expense and makes me realize how handy those 50% off Joann coupons have been. And good point on the death of “sewer” 😄. Wow! Your new room is great! I also have a custom work table. We built it in the room because it’s too big and heavy to move down the hall and stairs. I put pegboard on one end and hang my acrylic rulers and quilting hoops on it. I’d have more hanging there, but with preschool granddaughters often visiting, rulers and hoops are safer than scissors and such. I’ve been contemplating putting my scissors on the side vs the pegboard between the two shelves. But, I’m nervous about always knocking in to them since I don’t have a particularly wide berth. Great table! I’m sure the extra size will come in handy at some point. Can you use two cutting mats, side by side, instead of the expensive bigger one? My back has so had it floor cutting too, I’m going to have to think of creative options for my (small) apartment. Probably some sort of Ikea ‘hack’ or another also (I dislike that word too!). A very clever solution to making a rollable cutting table. Have you thought about making the table 62″ wide? That way you can cut 60″ goods totally flat. I think you may not the room in your sewing room, right? I did. But, there’s not enough room and it’s only once or twice a year I cut single layer. So clever! I love the table and it looks great too! 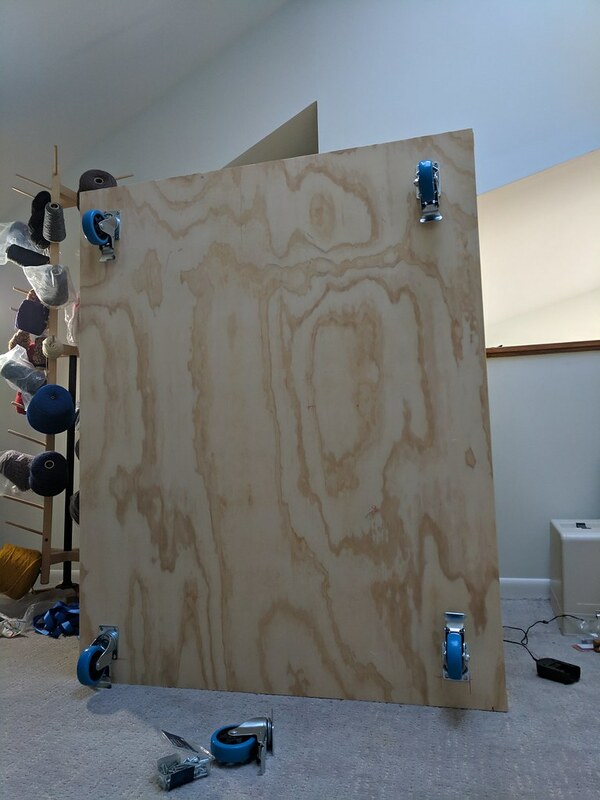 I’m looking forward to the pegboard since I’m planning on adding one to my sewing room too. Just in the thinking stage right now so I can piggy back onto your expertise. That looks amazing! I’m so happy for you that you have such a great sewing space now (or are well on your way to have it). I have my attic dedicated to sewing too and I love it (don’t remember if I already had it when we saw each other, but I think it was). Actually, after posting this I’ll go up to sew and rummage around, tidy the place up a bit. I haven’t had much time to use it lately, but just being there makes me happy. By the way, I had never heard about the pinnable layer. Something to look into! Ha ha, all that sewing room glory, but I do a double take when I see your print of the clocks at Flinders Street Railway Station! I caught the train home from there this evening, how funny to see it in your lounge room on the other side of the world! 😊 I took that photo when I went with my mom over 10 years ago. I need to get it reframed and convince my husband it’s worth the 36 hours of travel to go back. I loved every moment in Australia. I met you at FabricMart yesterday. We discussed the Jalie Gerald Pattern. I had problems because I miscut the pieces. I cut a new muslin and put it together within an hour . . . you inspired me to sew many items such as vogue 9351 (though you made a coat), and New Look 6351 (which is why I bought so much dark chambray). I keep considering Burda but am sticking with the Big 4 for now. Obviously, I need to practice tracing.